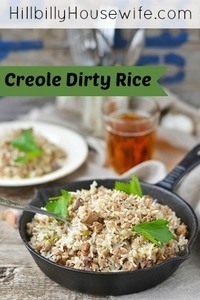 This is a traditional dirty rice recipe that calls for liver. You can use either chicken or beef liver for it. Or if that isn’t your thing, replace the liver with a bit of sausage. This makes a nice one dish meal that’s filling and frugal. It’s also a great way to use up leftover rice. While the veggies used are those that are traditionally in dirty rice (peppers, celery and onion), feel free to replace them with any type of leftover veggies that sound good. Start with the recipe below and then tweak it from there depending on what you have in the fridge that needs to be eaten. Put a large skillet over medium-high heat, add the cooking oil, and when it’s hot, add the liver pieces and cook quickly until just browned; remove pieces using a slotted spoon and set aside. Add the green bell pepper, celery, and onion to hot skillet and cook until softened slightly; then turn heat down to low. Add the liver back into the skillet, then add the crushed tomatoes, basil, salt, pepper, and garlic powder, stir, cover skillet and simmer gently for 30 minutes. Remove cover and stir in cooked rice, then serve.